How Much Formula OR Expressed milk does your Baby need? The amount of milk that your baby needs has a rather individual answer, however lots of parents often ask me how much for what age their baby is...... so the following is a guide to give you that answer. I have provided it as a chart to make it easier for you to read and compare. My suggestions to print this out and highlight the age your baby is so that it is easy to see. I find it is helpful to know amounts when you are either expressing breast milk to have a amount that should satisfy your baby or when mixing infant formula if you are combined feeding, using an occasional top up bottle or using formula as a substitute. Of course, all formula companies and packaging have on the back of the stick pack or the tin the amount of cooled boiled water you need and the volume to make up in the bottle – so please refer to their exact instructions. Do not add more scoops or make a big scoop etc, it is a precise and measured amount for many reasons including dehydration. So do your best to measure accurately. Where has this information and the suggested amounts come from? Good question: The amounts are based on the revised recommendations from “Nutrient Reference Values for Australia and New Zealand” Australian Government Department of Health and Ageing. National Health and Medical Research Council. These guidelines are just that, a guideline. 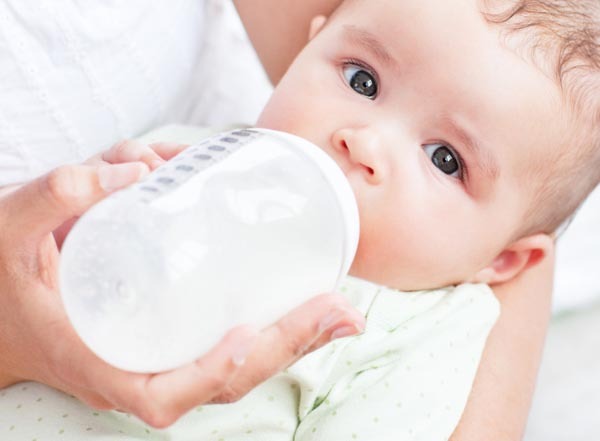 Your baby may drink a little more or a little less, if they have trouble finishing the bottle that is ok, let them tell you when they are finished. They do not have to finish it. If on the other hand they guzzle the bottle of milk down very fast, offer a little more. If they drink hungrily, then slow down and then just finish the bottle, they have had enough, you do not need to offer more. They will be fine.